Discussing policies and practices to improve teaching and learning with other countries and applying these lessons in the United States as appropriate are critical elements in the Department’s efforts to strengthen U.S education. To that end, the Department supports benchmarking U.S. education against that of other countries. The goal is to identify areas of relative strength and weakness and use this information to guide our deeper learning. At the same time, we view this as a shared endeavor in which the United States not only learns from other countries but also shares U.S. experiences and lessons learned with other countries. 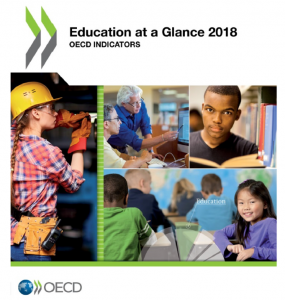 The United States contributes expertise and data to the Organisation for Economic Co-operation and Development’s (OECD) annual Education at a Glance (EAG) publication, which compares OECD countries on a variety of important education indicators, such as educational attainment, the financial and human resources invested in education, access to and participation in education, and the learning environment and organization of schools. The United States regularly participates in international education assessments and surveys as the first step in benchmarking education in the United States against other countries. 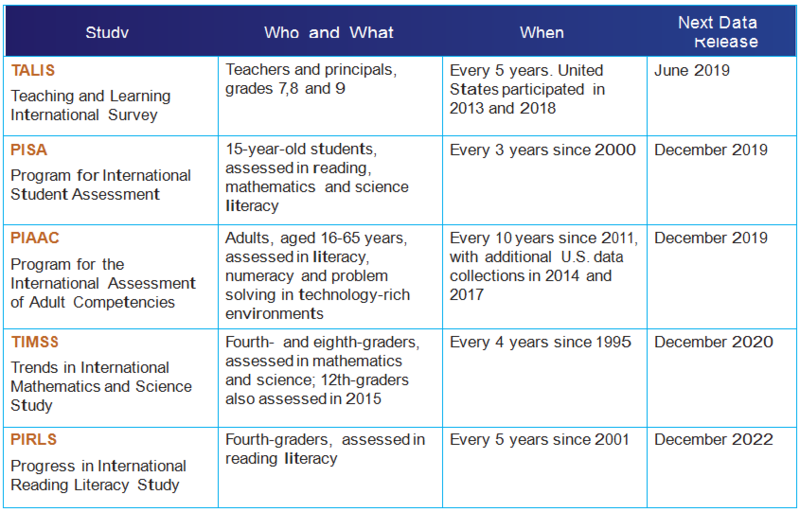 These assessments and surveys include TALIS (Teaching and Learning International Survey), PISA (Program for International Student Assessment), PIAAC (Program for the International Assessment of Adult Competencies), TIMSS (Trends in International Mathematics and Science Study) and PIRLS (Progress in International Reading Literacy Study). In 2018, the United States participated in the new IELS (International Early Learning Study) and for the first time in the ICILS (International Computer and Information Literacy Study). The Department’s National Center for Education Statistics (NCES) implements these assessments in the United States. NCES also serves on the studies’ international governing boards and collaborates with other countries to continually improve data quality. From these studies we learn not only how the United States compares to other countries in terms of student and adult performance, but we also learn what U.S. students know and can do in key subject areas (and about contexts for learning) as well as how an individual’s skills relate to his or her experience at work and outside of work. Through partnerships with multilateral organizations and with individual countries, the Department is delving more deeply into what works in other countries and is learning more about innovative practices and how they could be applied in the United States. The Department is promoting active dialogue about education topics of mutual interest, including career and technical education, apprenticeships, teacher quality and individualized learning. Senior officials in the Department also engage in strategic travel overseas to visit schools and to meet with teachers, students, education policy makers and experts, and often host visits from education policy makers and experts from other countries. The Department will continue these and similar efforts aimed at understanding what works in high-performing countries. 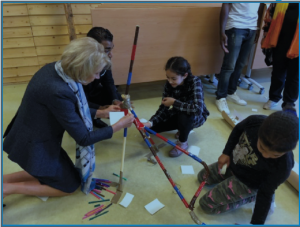 During Secretary DeVos’ first international trip as the U.S. Secretary of Education, she visited Switzerland, the Netherlands and the United Kingdom and saw how students in these countries pursue their education. As the Secretary described in her blog after the trip, each country takes a holistic approach to education to prepare students for career and life success, with a variety of possible educational paths. Families choose the school and type of education that will best meet their child’s educational needs. Return to International Strategy. Go to Objective 1, Objective 3.